Landscapes Through Time premiered June 16, 2008. Great artists have always viewed the world through a different lens, and these unique visions and perceptions have fascinated, delighted—and sometimes outraged—people throughout history. 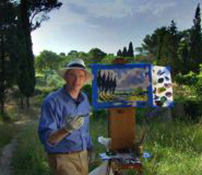 This television series offers viewers the opportunity to experience that unique artistic vision in a new way—a series that walks in the same renowned gardens, groves, seascapes and mountainous terrains that served as the inspiration for some of the world's most celebrated and familiar works of art. Artist and teacher David Dunlop retraces the steps of famous landscape artists to reveal their inspiration and techniques. Landscapes Through Time with David Dunlop is a lively series, shot in breathtaking HD, that travels with noted painter and lecturer David Dunlop as he follows the lives and artistic paths of celebrated artists such as Turner, Monet and Renoir. Dunlop journeys to the enchanting locations these artists visited, and then learns how they transformed that vision into a familiar painting, such as Monet's water lily garden in Giverny, Van Gogh's asylum in Provence and the Hudson River Painters' Kaaterskill Falls in New York. Dunlop's infectious enthusiasm and vast knowledge of art, philosophy and history inspire every episode. He shares his passion for landscape painting and his artistic skill as he paints the same storied landscape in the technique of the artist. In each episode, Dunlop takes us to a beautiful place that inspired a famous artist and sets the artists in their appropriate historical context, discussing who, when, where, how and why they painted. He then sets his easel in the same place that the legendary artist set his and paints that same landscape in the style of the artist, explaining each step of the painting process and providing artistic, technical, optical and perceptual insights. After revealing the techniques and secrets of the masters, Dunlop offers tips and techniques while working with one of his students transforming his or her painting at the same location. The series travels to an array of stunning locations in the U.S. and France, retracing the steps of famous artists. Dunlop visits Claude Monet's home in Giverny, France to paint his water lily garden. He also travels to the asylum of St. Paul de Mausole in St. Remy en Provence where Vincent van Gogh committed himself in 1889 and painted many of his masterpieces, including Starry Night, Olive Trees and Cypresses. David Dunlop travels to the South of France to paint a vista of cypress trees just as Vincent Van Gogh did here With his easel and painting supplies in hand, Dunlop scales up the rugged terrain of Kaaterskill Falls in upstate New York where Hudson River painters Thomas Cole, Asher Durand and Sanford Gifford all found inspiration. His journey also leads him to Pierre-Auguste Renoir's home and garden at Cagnes Sur Mer, France; the Lieutenant River in Old Lyme, Connecticut; the white cliffs of Etretat on France's Normandy Coast; and Contentment Island off the coast of Connecticut where John Frederick Kensett painted the Long Island Sound. With engaging demonstrations for the painter and non-painter alike, Landscapes Through Time with David Dunlop appeals not only to artists, but to anyone fascinated by art and the process of its creation. 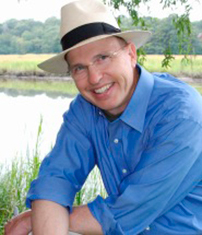 Landscapes Through Time with David Dunlop was co-produced by SimmonsArt, Inc. and Connecticut Public Television. Visit www.landscapesthroughtime.com for more information about the series and David Dunlop's work. © 2015 SimmonsArt, Inc. All rights reserved. Text by Lee Newton. Photos by John Atashian and Connie Simmons.